The scene could not have been scripted better. I am playing golf at Callaway with forty-five of my fraternity brothers in the 23rd Annual Divot Masters Tournament. It was a best ball scramble and that format makes a hacker like me feel useful for at least one or two shots in a round. 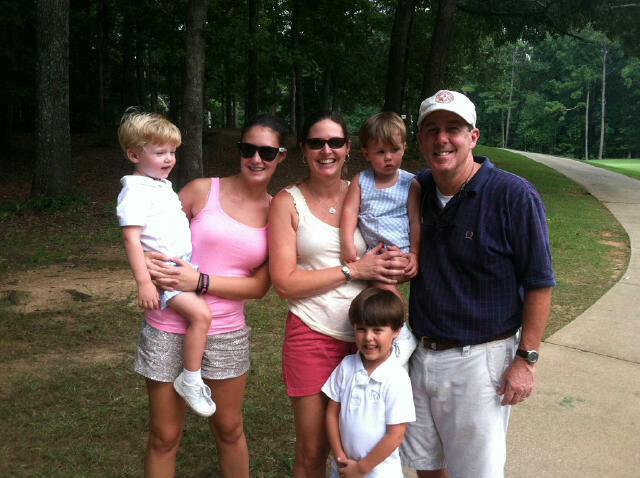 My smoking hot wife Kristen and my four children (those still at home) had just arrived and were following not far behind in a Callaway provided gratis cart. To everyone’s surprise, the boys, all five and under, Dow, Whit and Graham, were on their best behavior (read quiet or didn’t cough during backswings like the Brothers). Life is good. Says My Game is Brutal! all remaining inhibition. Hats off to those who reined in the profanities for the sake of my family! Fast Eddie sat the drive out. Consequently, I, the D player, was the first to tee off on this 18th hole of golf. 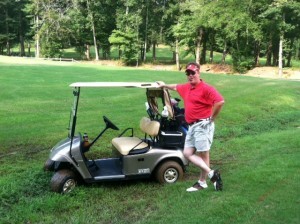 Having “brutalized” (hat tip to Neal Smith) the game of golf for first 17 holes, I had no inkling of what would follow. Boom! My drive was straight down the right tree line of this dogleg right. Sweet! We had one in play. So the others, Himmy, Neal and Reggie, all far better golfers, could let it rip. All hit well, as expected, but mine, yes mine, remained the long drive. The approach shot was 110 yards. I had been over swinging so I opted for more club and less swing. I said out loud, “Let this one count.” It did. My boys ran on to the course with high fives. Suddenly daughter Madison was my cart chauffer. It doesn’t get any better than this. At three inches from the pin, my approach stood up and it remained my turn, MY turn. Honors on a golf course are rarely associated with John Richardson. I tapped in for birdie. Even the normally raucous and X-rated heckling turned to delight. I was basking in the light of life in the short grass! An hour later, as I drove home, I recalled the conversations over the last 48 hours. My mind was easily drawn away from the thrill and to life in the tall grass, even weeds, where we mortals do most of our living and dying. We spoke of and with brothers who were once on the edge of death and survived. We spoke of and grieved those who didn’t. Evidence of the Great Recession was apparent in some listless eyes. The pain of divorce was etched in some faces. There were a number of us with children who had chronic illnesses and others who whispered of enduring youthful rebellion (with the attendant unspoken pain of realizing history often repeats itself). One dear soul said he was blessed that parenting challenges came one at a time, grateful they didn’t come in fours which for him was always a possibility. One of us buried his father two weeks ago. Another is making similar arrangements for the days just ahead. Some, if not many, have self-medicated somewhere along the way. The unspoken pain is great, the grass tall. There was a lot of tall grass in our stories. Weeds too. Some like kudzu, the kind that chokes out life. The tall grass is not there because we ATOs were or are reprobates more than most (though some of us, including this Tau, exceled in debauchery for quite the stint). No, the noteworthy existence of tall grass was precisely because we are ordinary, very ordinary. At the end of the day most of life is lived in the tall grass. Soon I was calling to mind beloved elsewhere beyond Divot Masters. One just suffered through significant surgery to remove cancer. Another lives a tortured life (a quiet and hidden one of desperation) constantly wondering his worth in spite of all the love around him. Three little girls have had their lives shattered by circumstances beyond their control. A father begs for his daughter’s life after she attempted to throw it out. I myself have an ache in my chest that is 14 years old and I wonder if it will ever go away. There is plenty of short grass but always someone nearby is living in the tall grass and some are being snuffed out by weeds. Before becoming morose, let this word be encouraging. Where is the consolation that makes life in the tall grass bearable? Is it in a life in the ever so fleeting short grass? No. The consolation is found in delight. What I experienced on the 18th green was delight, delight from my family, delight from my Brothers. I experienced delight when Dow said he had a hole in his heart while I was away. He delights in me. As I typed this I grabbed another cup of coffee and Graham made me come back and hug him three times. “Wait daddy.” Graham delights in me. And this seemingly incomparable wonderful animating delight that at once brings smiles to my face and tears to my eyes pales, yes pales, in comparison to the one meant to sustain me. “For the LORD takes delight in his people; he crowns the humble with victory.” (Psalm 149:4). The consolation is not found in the tap in for birdie. It is found in the delight. When stuck in the tall grass, it is easy to forget that we were created by and saved by and are transformed and sustained by the Almighty maker of heaven and earth and He delights in us. What does delight look like? You can see it on my face when almost two Graham crawls into his brother Whit’s bed at 7:00 am and says, “I love you, Wheet, Wheet.” Thank God for video monitors. You see it in my eyes when Dow and Whit are snuggled up together watching an episode of Jake and the Never Land Pirates. It was only five minutes ago they were pummeling each other. My daughters and grandson delight me in the very same way. Kristen sees delight on my face with every passing sunset on the Gulf. We know best what delights us. But do you know what delights God? You! You warm His heart. You make it soar. Not because you’re perfect. No. He delights in you in spite of your imperfections. You’re his handiwork. He numbered every hair on your head. He aches at your pain whether you created it yourself or if someone else heaped it upon you. He just loves. His love does not measure. It just delights. No, this in not permission for licentiousness. Don’t get me started on the consequences of sin. Devastating! It breaks us. It breaks our relationships. It breaks that in which He delights. No one knows it better or aches from it more than the Father. So He says “no” to sin but screams “yes” to us. I wonder if for Him relating to us sinners is not like those moments when I have to hide the smile on my face just before I discipline my children. In spite of their willfulness, I love them. I delight in them. The stern and somber face is hiding a smiling heart. They are, after all, the fruit of my loins, well at least my parenting. They are my handiwork for better or worse. Delight! 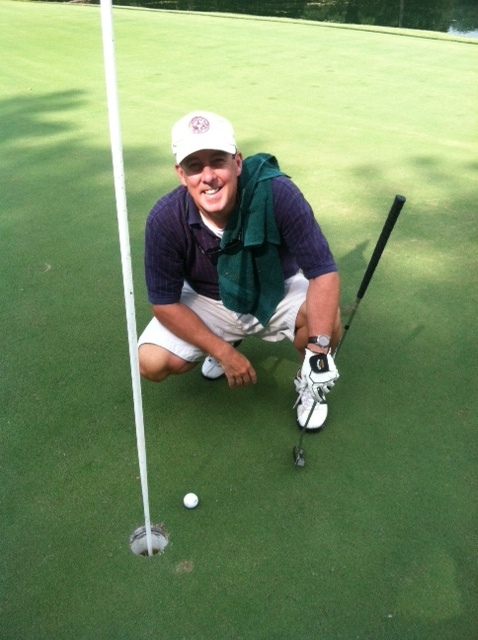 I enjoyed a moment of it after I tapped in the birdie putt. Life in the short grass is good. But for 17 holes I was in the tall grass and that is where the average bear does most of his living and dying. It is the delight of God that makes the tall grass bearable. For His delight is unparalleled. It can’t be captured by comparing filet to ground beef. His delight is a category of its own. It’s incomparable. For those in tall grass, recall this. Find consolation in His delight. We worship a high fiving fist pumping God who forever delights in us! This entry was posted on Tuesday, August 27th, 2013 at 5:14 PM. You can follow any responses to this entry through the RSS 2.0 feed. You can leave a response, or trackback from your own site.